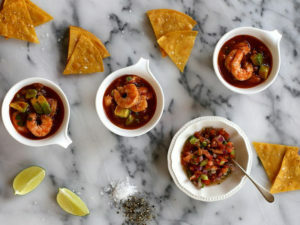 In a medium bowl, stir together ketchup, Pico de Gallo, lime juice, olive oil and hot sauce. Taste a bit of the mixture and add more hot sauce, salt and pepper to your taste. Add the steamed and chilled shrimp, the avocado, and the cilantro. Stir to combine. Taste again and season accordingly. Cover and refrigerate for at least an hour before serving. Serve chilled with crisp tortilla chips. Glass I Love! Check out Eli’s Installation.